The following clarifications are not intended as criticism of Mother Jones or A.J. Vicens. 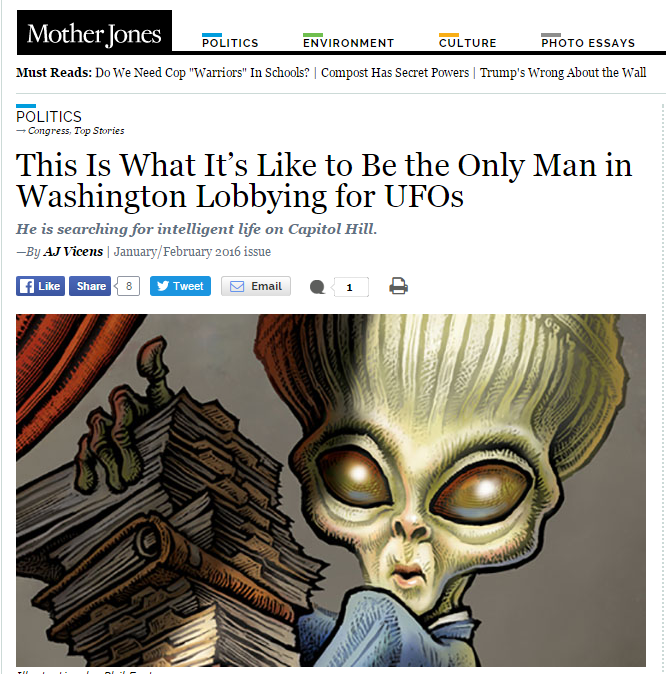 Rather they are in service to the reality the largely millennial reporters and editors working today do not possess a knowledge base for the extraterrestrial presence issues.Mother Jones is doing important, historical coverage that is much appreciated. Correction: Bassett ran for Congress in 2002 as an independent. There was no primary, and he was on the November ballot via signatures. He participated in a number of debates and forums. Correction: the article seems to indicate Bassett has met with staff from 190 congressional offices. He has submitted requests to meet with 190 offices and met with two dozen staff. Language: The "UFO" acronym is used 17 times in the article. Bassett is not "Lobbying for UFOs." In fact, his work has nothing to do with "UFO's." "UFO" is part of the language embraced by the government in support of the truth embargo. He is a registered lobbyist addressing the sociopolitical and national security implications of an extraterrestrial presence engaging the human race. The evidence for this extraterrestrial presence is now overwhelming, and half the American people know this. Over 80% of the American people feel the government is not telling truth on the issue. They are right. Perspective: the article gives the impression Bassett is a lone wolf crusader on a quixotic mission. In fact there are tens of thousands of people around the world involved in the Disclosure advocacy movement, which exists mostly in cyberspace. There are thousands of web pages, Facebook groups/pages, twitter accounts, organizations, etc. behind the movement. Other nations have their own advocates. Lastly: PRG is sure Bassett's good friend and colleague, Nick Pope, meant he did not know how the British government works :-).